The Lamrim system is a practical, step-by-step presentation of the entire stages of the path to enlightenment, starting from the very beginning of an individual’s spiritual development, and leading progressively to the state of Buddhahood. As such, it is a system that is practice, rather than theory-oriented. 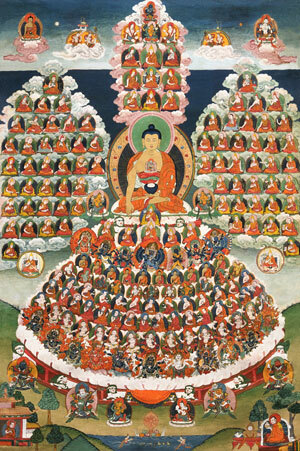 This is done so according to the three capacities of beings: lower, middling and highest. These capacities represent the individual proclivities and faculties of beings, according to the level of their spiritual development. The path of the being of lowest capacity leads beings to safety from the fears of the lower realms, while the path of beings of middling capacity leads beings to safety from the fears of cyclic existence. Finally, the path of beings of highest capacity leads to the states whereby all suffering and the two obscurations – afflictive and cognitive – are completely exhausted. The excellence of establishing all the of the teachings as non-contradictory: allowing beings to realize that all of the Buddha’s teachings, without exception, are paths that lead individuals to the state of enlightenment. The excellence of taking all the teachings as a personal or pith instruction: allowing beings to understand all of the Buddha’s teachings as being personal instructions for bringing an end to one’s own mental afflictions. The excellence of making the thought of the victors easy to comprehend: allowing beings to immediately understand the very essence of the teachings with ease. The excellence of causing negative behaviors to naturally decline: causing the negative emotions as well as the harmful behaviors they motivate to be put an end to with ease. Part one of the series will focus on the commonly shared paths of the beings of lowest and middling capacity, while part two will focus on the uncommon stages of the path of the being of highest capacity. Part one of the series will focus on the commonly shared paths of the beings of lowest and middling capacity, while part two will focus on the uncommon stages of the path of the being of highest capacity. The six preliminaries to be done before mediation on the stages of the path. How to rely properly on a spiritual mentor and the precious human life of leisure and endowments. How to meditate on death and impermanence, the suffering of the lower realms, and the correct manner of taking refuge in the three jewels. The law of karma, and the ten virtues which form the basis of Buddhist ethics, together with a discussion of how to purify negative actions by relying on the four powers. This class will introduce the four noble truths, the twelve links of interdependence which drive the endless cycle of birth and death and, how to develop renunciation – the wish to be liberated from all the fears of cyclic existence. Finally, the class will discuss the practice of the three higher trainings. 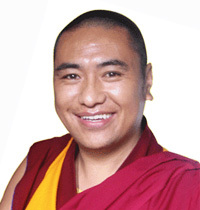 Geshe Ngawang Phende was born in Nepal in 1968. As a young boy he entered Drubthob Rinpoche’s monastery in Nepal where he received his initial monastic training. He joined Drepung Loseling Monastery, south India in 1982 at the age of 12, where he successfully completed his monastic education and passed the Geshe Lharampa examination in 2001. He then attended Guymey Monastery for further Tantric studies and stayed there for a year. Geshe Ngawang was the resident teacher at the Lam Rim Tibetan Buddhist Center in Johannesburg, South Africa for nearly four years. Twice he has been on the Mystical Arts of Tibet tour and at present is one of the resident teachers at DLM. A voluntary offering to the teacher is customary in the Buddhist tradition. Payment and registration deadline is four days before the event date. One-day events: If you withdraw before the day of the event, we will refund your fees, minus a $20 administrative charge. You must speak with a member of the administrative staff by 6pm. Leaving a message will not alter your registration. There will be no other refunds. If you do not attend a session it is counted as a withdrawal and there will be no refunds or exchanges. *When purchasing a series for either the Foundation or the Intermediate classes note that the series advantage gives you a lower rate and purchasing classes individually gives you flexibility. When purchasing these series the first class will count toward the one day cancellation policy. After the first class has begun for the purchase of the series there will be no other refunds or exchanges. Multiple-day events: If you withdraw before the start of the retreat, course, or event, we will refund your fees, minus a 10% administrative charge. If you withdraw after the first retreat or teaching session, we will refund 75% of the fees. After the start of the second session there will be no refunds.